For the standard McLaren F1, see McLaren F1. The McLaren F1 LM is a track oriented edition of the McLaren F1 built to honour the five McLaren F1 GTRs that competed and finished the 1995 24 Hours of Le Mans in first, third, fourth, fifth and thirteenth places overall. The LM is based on the McLaren F1 GTR and built on the standard F1 chassis, with modifications necessary for the modified GTR to be a road legal car—but without the engine intake restrictions that racing regulations impose on the GTR racing car. In late 1995, McLaren built five F1 LMs (LM for Le Mans) in honour of the five McLaren F1 GTR's that finished the 1995 24 Hours of Le Mans and took the overall win. McLaren designed the standard F1 as an ultimate road car, in the sense that it strives to be comfortable and usable in everyday conditions despite being a potent sports car. However, the LM edition is a lower and stiffer, track-oriented vehicle, with a stripped down, bare interior, and solid aluminium bushings in place of the rubber bushings in the suspension system and without the Ground Plane Shear Centre system on the standard F1. Of the production run of six, five F1 LMs were sold and the sixth, the Papaya orange prototype F1 LM, XP1 LM, was retained by Mclaren and used as the platform for the continued development of the F1 chassis. This car, reportedly worth $25 million, was promised by McLaren CEO Ron Dennis to his driver Lewis Hamilton if he should win two Formula One World Championship titles. Subsequently however, Lewis Hamilton left McLaren with his single World Championship title to drive for the rival Mercedes Formula 1 team in 2013 and the car still remains in possession of McLaren. The F1 LMs can be identified by their Papaya orange paint. 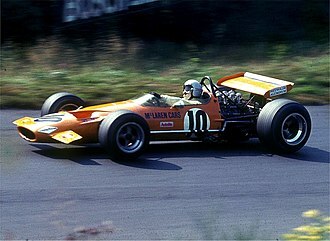 The F1 LM's were painted in this colour in memory and tribute to Bruce McLaren, whose race colour was Papaya orange. It has been discovered however, that contrary to the official word from McLaren at the time, only four (including the prototype) of the LMs were originally painted 'Papaya' orange, with two of the three delivered to The Sultan of Brunei being painted black with graphics. The weight was reduced by approximately 60 kg (132 lb) over that of original, through the removal of various pieces of trim and use of optional equipment, i.a. no interior noise suppression, no audio system, a stripped down base interior, no fan assisted ground effect and no dynamic rear wing—giving the McLaren F1 LM a total mass of 1,062 kg (2,341 lb). 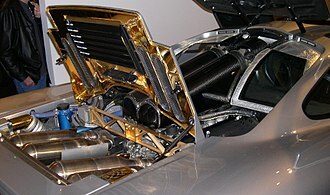 The F1 LM also used the same engine as the 1995 F1 GTR without the race-mandated restrictors. The engine has a compression ratio of 11.0:1 and produces 680 bhp (507 kW; 689 PS) at 7,800 rpm. 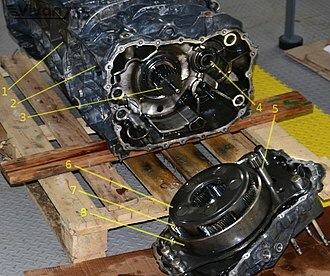 It has a peak torque of 705 N⋅m (520 lbf⋅ft) at 4,500 rpm; the redline is at 8,500 rpm. The total weight and horsepower of the car gives it a weight to power ratio of 3.4 lb/hp. The aerodynamics of the LM is directly derived from the GTR race car. The bodywork of the vehicle has the addition of a larger cooling duct at the nose of the machine and cooling ducts on either side of the car for the brakes where the storage lockers are seen on the standard F1. In the place of the small dynamic rear wing seen on the regular F1 there is a considerably larger, adjustable (but not active, i.e. automatically adjusted) CFRP rear wing mounted on the back of the vehicle, it has a CFRP splitter at the front, side skirts and extensions for the wheel arches to increase downforce and thus give the car more grip. The car also features the diffuser from the GTR race car. The McLaren F1 LM uses Michelin SX-MXX3 tyres and features specially-designed 18-inch (457 mm) magnesium alloy wheels. The tyres at the front are 275/35 ZR 18, while at the rear 345/35 ZR 18. The front wheels are 10.85 x 18 inches and at the rear 13.00 x 18 inches. The carbon ceramic brakes on the GTR are not present on the LM, the front and rear callipers on the brakes are four-pot monobloc light alloy calliper, ventilated using the GTR95 Brake Cooling System. 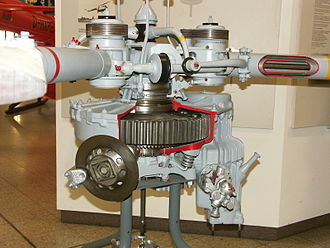 The LM has an upgraded gearbox with gun drilled driveshaft from the Le Mans specifications, tripod CV joint and straight cut gears, although the gear ratios are identical to the standard F1, i.e. 3.23:1, 2.19:1, 1.71:1, 1.39:1, 1.16:1, 0.93:1, with a final drive of 2.37:1. 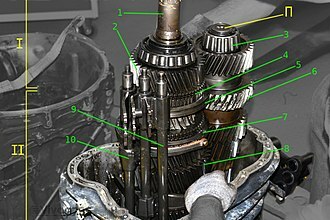 The magnesium casing for the gearbox that first appeared in the 1996 GTR is not in the LM. The clutch of the LM is a hydraulic remote actuation triple plate carbon/carbon clutch, the clutch is 200 mm (7.87 in) in diameter. The McLaren F1 LM has a fuel tank capacity of 90 l (23.8 US gal). The F1 LM is considered the fastest incarnation of the McLaren F1 road cars through the gears and in overall track performance. It has a tested 0-60 mph (97 km/h) time of 3.9 seconds due to wheelspin at the start, 0-100 mph (161 km/h) in 6.7 seconds and was once the holder of many world records, including the 0-100-0 mph record it completed in 11.5 seconds (over a distance of 828 feet or 252 metres) when driven by Andy Wallace at the disused airbase RAF Alconbury in Cambridgeshire. 225 mph (362 km/h), which is less than the standard version due to added aerodynamic drag. Wikimedia Commons has media related to McLaren F1 LM. ^ a b c "Ultimatecarpage on the McLaren F1 and its derivatives". ^ "McLaren Automotive - LM history". Archived from the original on 18 November 2006. ^ a b c d e f g "McLaren F1 LM". Supercars.net Publishing. Retrieved 5 May 2008. ^ Piecha, Stan (26 March 2008). "The Sun - Hamilton promised $4m supercar if he wins 2 titles". London. ^ a b c "McLaren Automotive - LM introduction". ^ "McLaren Automotive - LM specifications". 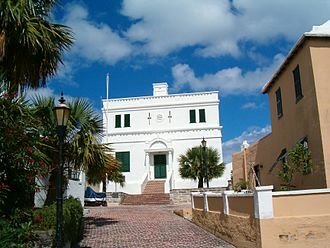 Archived from the original on 10 November 2006. ^ a b c d e f "McLaren Automotive on detailed specifications for the LM". ^ a b c d "MotorTrend, with CAR Magazine, April 2000". Archived from the original on 6 October 2015. 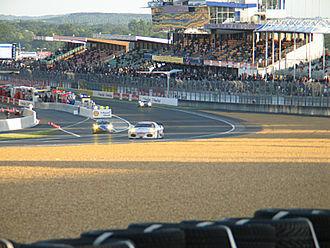 The 199524 Hours of Le Mans was the 63rd Grand Prix of Endurance, and took place on 17 and 18 June 1995 in one of the wettest races in the events history with about 17 hours of steady rain. The race was won by the #59 McLaren F1 GTR driven by JJ Lehto, Yannick Dalmas and this was the first Le Mans win for a driver from Finland and for a driver from Japan. 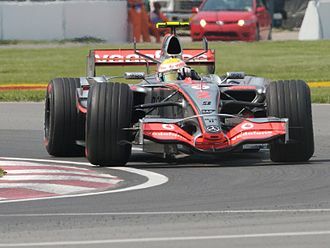 It was McLarens first win, at its first attempt, Mario Andrettis Courage finished second, having been the sentimental favourite of many in the run-up to the race. The top three spots in GT2 were taken by Honda NSX and two Callaway Corvettes, the class was now showing manufacturer diversity unlike previous year dominated by the Porsche 911 derivatives since the mid-1970s. With the ongoing good working relationship with IMSA, the Automobile Club de lOuest phased out its LM P1 category, in return, IMSA agreed to allow turbo-engined cars into WSC, given the number of Group C chassis still in circulation. The LM P2 class was left as is, however the other classes had the following restrictions, some revised from the previous year, however, GT2 cars now had to be based on cars in series production since February 1995. As before, these generated a huge amount of interest. In response, the ACO built 2 further pit bays to increase capacity to 50 cars and they granted 20 well-performing teams an automatic entry, chose a further 50 to go through qualification for the remaining 30 spots on the grid. It aimed to keep a balance between the WSC and over-represented GT classes, although the lines were now blurring a bit in GT1. Sportscar specialists Courage, Kremer, WR and Debora returned in WSC/P2, along with the first Ferrari prototype seen at Le Mans for 23 years, which had been running in the American IMSA championship. 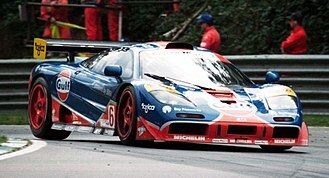 But the biggest splash came from McLaren, its new F1 GTR supercar had won 6 of the 7 races in the 1995 BPR Global GT series to date. Six of the McLarens from that series arrived, and even the original T-car was hastily prepared for a new Japanese team desperate to be involved, the ACOs air restrictors limited its engine to 636 bhp, just 9 more than the road-going version. Other returning marques in GT1 included Jaguar and Porsche, with single works entries from Venturi, in GT2, the ubiquitous Porsche 911s were up against Callaway and newcomers Marcos. 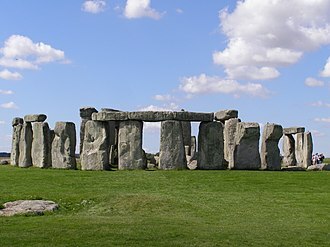 Surrey is a county in the south east of England. 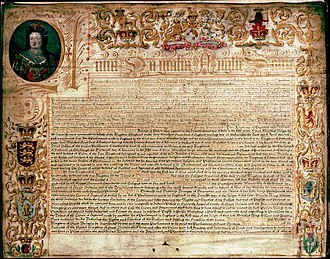 It shares borders with Kent to the east, East Sussex to the south-east, West Sussex to the south, Hampshire to the west and south-west, Surrey County Council sits extraterritorially at Kingston upon Thames, administered as part of Greater London since 1965. With a resident population of 1.1 million, Surrey is the most densely populated and third most populated county in the South East region, after Kent, the London boroughs of Lambeth, Southwark and parts of Lewisham and Bromley were in Surrey until 1889. The boroughs of Croydon, Kingston upon Thames, Merton and Richmond upon Thames south of the River Thames were part of Surrey until 1965, when they too were absorbed into Greater London. In the same year, the county was extended north of the Thames by the addition of Spelthorne, due to this expansion, modern Surrey borders on the London boroughs of Hounslow and Hillingdon. 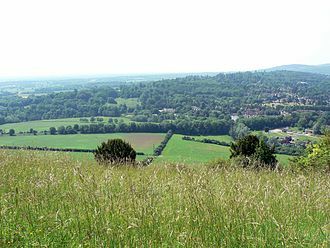 It has the highest GDP per capita of any English county, Surrey is divided in two by the chalk ridge of the North Downs, running east-west. To the north of the Downs the land is mostly flat, the geology of this area is dominated by London Clay in the east, Bagshot Sands in the west and alluvial deposits along the rivers. 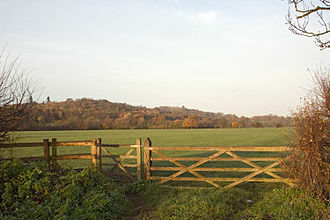 Much of Surrey is in the Metropolitan Green Belt and it contains a good deal of mature woodland. Among its many notable beauty spots are Box Hill, Leith Hill, Frensham Ponds, Newlands Corner and Puttenham & Crooksbury Commons. Surrey is the most wooded county in England, with 22. 4% coverage compared to an average of 11. 8%. Box Hill has the oldest untouched area of woodland in the UK. Surrey contains Englands principal concentration of lowland heath, on soils in the west of the county. Agriculture not being intensive, there are many commons and access lands, together with a network of footpaths and bridleways including the North Downs Way. Accordingly, Surrey provides much in the way of leisure activities. The highest elevation in Surrey is Leith Hill near Dorking and it is either 293,294 or 295 metres above sea level and is the second highest point in southeastern England after Walbury Hill 297 metres in West Berkshire. Ronald Dennis CBE is a British businessman and Official British Business Ambassador for The United Kingdom. Dennis is the Global Consultant for Minsheng Investment Corporation and owner of Absolute Taste and he is best known for his former role as owner, CEO, chairman and founder of McLaren Technology Group. Dennis was removed from his McLaren management roles in 2016 but remains a director of the company, since 1981, Dennis has been the team principal of the McLaren Formula One team, and was instrumental in transforming the outfit into a regular world championship contender. 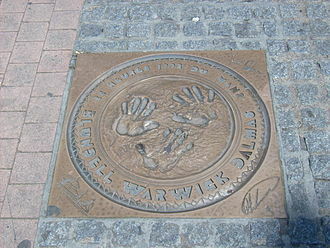 Constructors and drivers world championships were won with Niki Lauda, Alain Prost, Ayrton Senna, Mika Häkkinen and Lewis Hamilton. 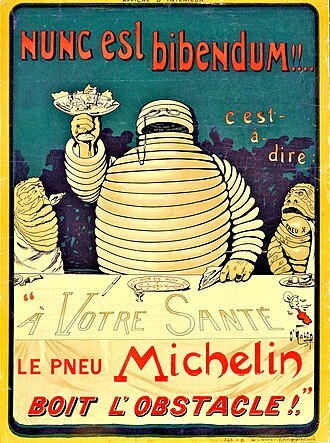 After being handed a three page business plan by a chef for his Formula One team, he set up a company, Absolute Taste. In January 2007, Dennis sold half of his 30 percent shareholding in the McLaren Group to the Bahrain Mumtalakat Holding Company, leaving him with a 15 percent share. In 2009, together with co-owners Mansour Ojjehs TAG Group, as of January 2014, Mumtalakat hold 50 percent of the Groups shares, with Dennis and Mansour Ojjeh holding 25 percent each. Ron Dennis was placed at number 648 in the Sunday Times Rich List 2006 with a net worth of £90 million, in the Sunday Times Rich List 2011, Dennis net worth is estimated to be £177m. In April 2014, it was stated he had a net worth of approx and his net worth grew in 2014 when he purchased McLaren Group. Aside from McLaren Group, he is one of six British business persons to be an official British Business Ambassador for advanced engineering and manufacturing. Dennis is a trustee for Tommys, a miscarriage help charity. He is the Global Consultant for the state owned China Minsheng Investment Group, with interests in foreign trade, Dennis became Chairman of the British East Asian Council in 2014. Before the merger with Louis Vuitton, Dennis was a shareholder in the luxury watch maker TAG Heuer, along with his business partner. Dennis tried to purchase the company again in October 2016, with a bid of 1. Dennis was born and raised in Woking and studied motor vehicle engineering at Guildford Technical College and he began working for the Cooper Formula One team in 1966 as a mechanic at the age of 18 where he worked alongside lead driver Jochen Rindt. Zak Brown is an American businessman and former professional racing driver, currently residing in London, England. Brown is currently the Executive Director of McLaren Technology Group and he is the founder and CEO of Just Marketing International, the world’s largest motorsport marketing agency. JMI, which was founded in 1995, was acquired in 2013 by CSM Sport & Entertainment, a division of Chime Communications plc, Brown began his racing career in karting in 1986. Brown won 22 races in 5 seasons from 1986–1990 and he moved to Europe where his first win was in Formula Ford 1600 at Englands Donington Park. Brown received his first accolade as a driver, earning recognition in 1992 from the American Auto Racing Writers and Broadcasters Association. In the 1992 Benelux Open Lotus Series Brown turned in top-ten finishes in each of the series races, the following year Brown finished 4th. At this point Brown was competing on both sides of the Atlantic, performing in North Americas Toyota Atlantic Series in addition to the Benelux Open Lotus Series, Racing For America, Inc.
named him as “Americas Most Promising Young Driving Star”. In the mid-90s Brown added two new racing series to his resume, making his Indy Lights debut at Laguna Seca Raceway in 1995 and he finished in second-place finish in the 199812 Hours of Sebring and had a third-place finish at Road Atlanta in the same year. Brown took a sabbatical from professional racing between 2001–2005 to concentrate on Just Marketing International, in 2006 Brown returned to the Britcar 24 Hours race, winning his class as part of a four-driver team. In 2007, Brown returned to racing in the 2007 Ferrari Challenge Series as part of a six-car stable fielded by Ferrari of Washington, at his debut in Fontana he started in pole position and led every lap of the race to take victory. The following year saw Brown return to competition where he was consistently at the front of the field. 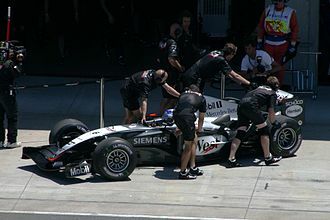 The 2008 campaign was highlighted by a win at Circuit Gilles Villeneuve in Montreal, in 2009 Brown and Richard Dean co-founded United Autosports. The McLaren P1 is a British limited-production plug-in hybrid sports car produced by McLaren. The concept car was capable of reaching speeds of 218 mph with the limiter on, debuted at the 2012 Paris Motor Show, retail began in the UK in October 2013 and all 375 units were sold out by November. The United States accounted for 34% of the units and Europe for 26% and it was considered to be the successor to the F1, utilizing hybrid power and Formula 1 technology, but did not have the same three seat layout as its predecessor. 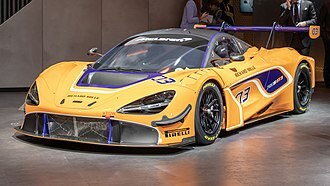 Its main competitors were the LaFerrari and the Porsche 918, a track version of the P1, the P1 GTR, was unveiled at the 2015 Geneva Motor Show. Production of the GTR was limited to 58 cars, the McLaren P1 is one of the main rivals going against the Porsche 918 Spyder, and the Ferrari LaFerrari. The P1 features a 3. 8-litre twin-turbo V8 petrol engine. The twin turbos boost the petrol engine at 1.4 bar to deliver 727 bhp and 531 lb·ft of torque at 7,500 rpm, combined with an in-house developed electric motor producing 177 bhp and 192 lb·ft. With both engine and the motor, the P1 has a total power and torque output of 904 bhp and 723 lb·ft of torque respectively. 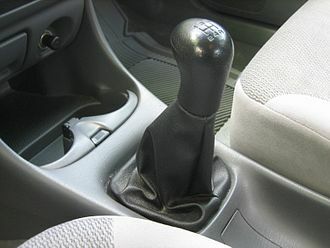 The electric motor can be deployed manually by the driver or left in automatic mode, whereby the cars ECUs torque fill the gaps in the engines output. 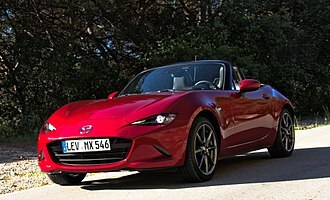 This gives the powertrain an effective powerband of almost 7,000 rpm, the car is rear-wheel-drive with a seven-speed dual-clutch transmission developed by Graziano. Power for the motor is stored in a 324-cell lithium-ion high density battery pack located behind the cabin. The battery can be charged by the engine or through a plug-in equipment, the car can be operated using either the petrol engine, the electric motor or with a combination of the two. The P1 has a range of at least 10 km on the combined European drive cycle. Under the EPA cycle, the range in EV mode is 19 mi, during EV mode the P1 has a petrol consumption of 4. 8g/100 mile, and as a result, EPAs all-electric range is rated as zero. The total range is 330 mi, the P1 combined fuel economy in EV mode was rated by the EPA at 18 MPGe, with an energy consumption of 25 kW-hrs/100 mi and petrol consumption of 4.8 gal-US/100 mi. The McLaren F1 is a sports car designed and manufactured by McLaren Cars. 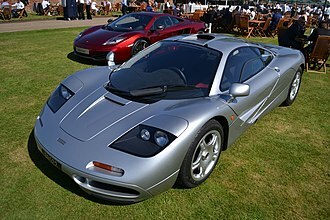 Originally a concept conceived by Gordon Murray, he convinced Ron Dennis to back the project and engaged Peter Stevens to design the exterior and interior of the car. On 31 March 1998, the XP5 prototype set the record for the worlds fastest production car, the F1 surpassed the Jaguar XJ220s 213 mph record from 1992, as well as the low production number RUF CTR2s 217 mph record from 1995. The McLarens record lasted until the Bugatti Veyron 16.4 beat it in 2005 with a top speed of 253.81 mph and it features a powerful engine and is somewhat track oriented, but not to the degree that it compromises everyday usability and comfort. It was conceived as an exercise in creating what its designers hoped would be considered the road car. Production began in 1992 and ended in 1998, in all,106 cars were manufactured, with some variations in the design. In 1994, the British car magazine Autocar stated in a road test regarding the F1, The McLaren F1 is the finest driving machine yet built for the public road. 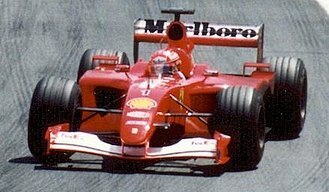 They further stated, The F1 will be remembered as one of the events in the history of the car. 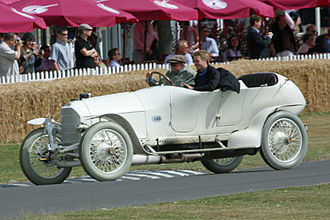 In 2005, Channel4 placed the car at one on their list of the 100 greatest cars. In popular culture, the McLaren F1 has earnt its spot as The greatest automobile ever created and The Most Excellent Sports Car Of All Time amongst a variety of car enthusiasts. Notable past and present McLaren F1 owners include Elon Musk, Jay Leno, chief engineer Gordon Murrays design concept was a common one among designers of high-performance cars, low weight and high power. 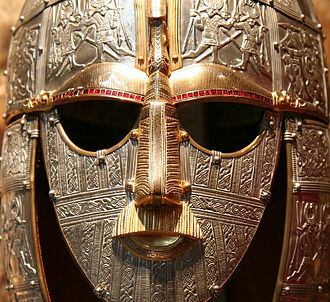 This was achieved through use of high-tech and expensive materials such as fibre, gold, magnesium. The F1 was the first production car to use a carbon-fibre monocoque chassis, Gordon Murray had been thinking of a three-seat sports car since his youth. 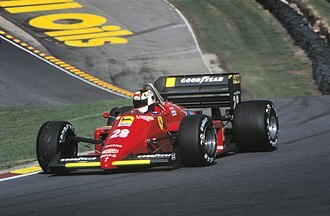 When Murray was waiting for a home from the Italian Grand Prix in 1988, he drew a sketch of a three-seater sports car. Murray declared that During this time, we were able to visit with Ayrton Senna, the visit related to the fact that at the time, McLarens F1 Grand Prix cars were using Honda engines. It is practiced in the automotive industry to reduce the costs associated with the development of products by basing those products on a smaller number of platforms. This further allows companies to create models from a design perspective on similar underpinnings. Platform sharing is a development method where different products and the brand attached share the same components. The purpose with platform sharing is to reduce the cost and have a more efficient product development process, the companies gain on reduced procurement cost by taking advantage of the commonality of the components. However, this limits their ability to differentiate the products. The companies have to make a trade-off between reducing their development costs and the degree of differentiation of the products, one of the first car companies to use this product development approach was General Motors in 1908. A basic definition of a platform in cars, from a point of view, includes and suspensions — where the underbody is made of front floor, engine compartment. Many vendors refer to this as product or vehicle architecture, the concept of product architecture is the scheme by which the function of a product is allocated to physical components. The car platform strategy has become important in new product development, the finished products have to be responsive to market needs and to demonstrate distinctiveness while — at the same time — they must be developed and produced at low cost. Adopting such a strategy affects the development process and has an important impact on an organizational structure. A platform strategy offers advantages for the process of automobile firms. Manufacturers are able to offer products at a lower cost to consumers, economies of scale are increased, as is return on investment. In the 1980s, Chryslers K-cars all wore a badge with the letter K to indicate their shared platform, in stages, the K platform was extended in wheelbase, as well as use for several of the Corporations different models. GM used similar strategies with its J platform that debuted in mid-1981 in four of GMs divisions and they were popular through the 1980s, primarily. Woking is a town that shares its name with the surrounding local government district, located in the northwest of Surrey, England. It is at the edge of the Greater London Urban Area and is a part of the London commuter belt, with frequent trains. Woking is 23 miles southwest of Charing Cross in central London, Woking town itself, excluding the surrounding district, has a population of 62,796, with the whole local government district having a population of 99,500. 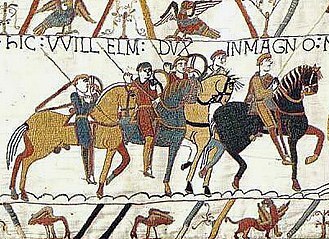 Woking has been a Conservative area since the constituency was created in 1950, though Wokings earliest written appearance is in the Domesday Book, it is mentioned as the site of a monastery in an 8th-century context, as Wochingas. As a result, the original settlement 1 mile to the south-east, on the River Wey, Woking Crematorium at St Johns became the first crematorium in the United Kingdom. This site was the home of the engineering firm James Walker & Company for many years, known as The Lion Works, this area was finally redeveloped in the 1990s into todays Lion Retail Park. This was a £40 million project to take hundreds of Woking homes away from the plain of the Hoe Stream. It has provided new community facilities and roads, Woking Borough Council had been planning this scheme, which was approved in September 2010, for over 20 years. It was being run in conjunction with the Environment Agency, the Council has received finance from, the Public Works Loan Board, a number of grants, including £3.7 million from the Environment Agency, proceeds from the sale of new homes and of other assets. The Council expects the scheme to be funded by 2014 with no ongoing costs incurred by the Council. The scheme was completed on schedule in 2012, the constituency of Woking has historically been a Conservative safe seat, with the Liberal Democrats being the principal opposition in the last five general elections. Its current Member of Parliament is Jonathan Lord, elections to the borough council take place in three out of every four years, with one-third elected in each election. Unable to find an agent for the sale of their surplus land at Hook Heath, the London Necropolis Company themselves developed the area into a prosperous suburb of large detached houses. The 1996 F1 GTR of Gulf Racing at Brands Hatch. The 1997 F1 GTR of Richard Smith driven by Kenny Bräck at Goodwood FoS. The BMW Motorsport entry during the 1997 FIA GT Donington 4 Hours race. The 1996 F1 GTR of Team Lark on display. McLaren P1 at Goodwood Festival of Speed in 2014. McLaren P1 in Race Mode while driving. Anthony Hamilton, Lewis' father and then-manager, celebrating with his son after the 2008 Brazilian Grand Prix. Hamilton's first Formula One win came at the 2007 Canadian Grand Prix. 675LT Spider at the 2016 Geneva Motor Show. Sultan Hassanal Bolkiah with the former President of the People's Republic of China, Hu Jintao. de Ferran at the Indianapolis Motor Speedway in March 2011. Dennis at the 1991 United States Grand Prix at the Phoenix street circuit.